We provide rockfall control fence systems designed to absorb impact loads of 30 ft-ton, 80 ft-ton, 180 ft-ton, and 250 ft-ton. All system designs have been tested and independently verified in China under the supervision of ISO9001. Our rockfall control fences are based upon a cable net panel woven in a continuous pattern around a border rope. 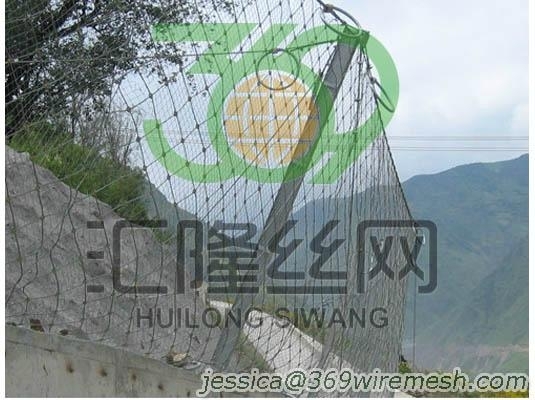 These net panels are extremely strong in resisting the tensile forces imparted to them by a rockfall incident. The forces imparted to the net panels are transferred to a system of support rope configurations attached to the net panels. These forces are then transferred to energy dissipation devices located in the support ropes that absorb the energies from the rockfall impacts. The support rope configurations are held at the appropriate elevation by steel columns.